Zeus3 chartplotter showing alternative PredictWind routing. 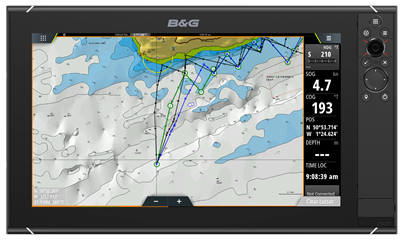 B&G®, the world’s leading sailing navigation and instrument specialist, is pleased to announce new software updates that will bring PredictWind weather services direct to Zeus and Vulcan chartplotter range. The online forecasting service provides the latest weather and sailing information to sailors all around the world. The software update will enable sailors with PredictWind accounts to plan routes in seconds using PredictWind data such as wind, swell, rain, cloud, isobar and air temperature information directly on a B&G chartplotter. Sailors can enter a preferred route and then receive a number of suggested optimum routes based on different weather models, times and days. Route information can be based on departures at a fixed time — good for racing yachts — or can provide multiple routes based on different departure times. · With Navionics Plotter Sync, sailors can easily download the latest Navionics chart data and transfer waypoints and routes between the Navionics app and a Navionics card via wireless connectivity to the chartplotter. Additionally, waypoints and routes can be imported from the Navionics card to the waypoints/routes/trails database of both Zeus and Vulcan display families. Plotter Sync requires a subscription to the Navionics app and a Navionics mapping card with an active daily updates subscription. · SonarChart Live helps raise awareness of shallow areas and reveals uncharted bottom features. SonarChart Live requires a Navionics mapping card with an active chart updates subscription. 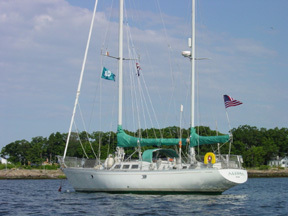 · New software enhancements to both the Zeus and Vulcan range enable them to also work directly with all third-party audio equipment that conforms to the NMEA 2000® Marine Entertainment/Audio Protocol, including select equipment from audio partners, JL Audio®, Infinity® and Polk® with more audio brands to come. The new software will be available to download from the B&G website www.bandg.com/en-GB/Support/Downloads/ late February 2017. For more information on the Zeus and Vulcan chartplotter range visit: www.bandg.com. For more information about PredictWind visit: www.predictwind.com.